Underfloor heating is the perfect solution for kitchens where space is at a premium. 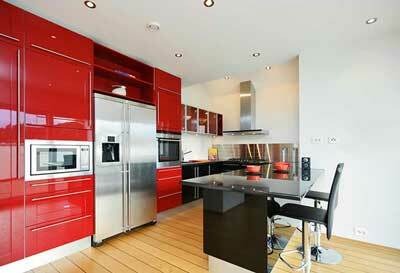 Why Underfloor Heating in your Kitchen? As the heart of the home, our kitchens tend to be the most-used room in the house and need to be able to cater for entertaining, cooking and relaxing. Underfloor heating is ideal for use in kitchens as it provides an ‘invisible’ approach to home-heating, perfect for rooms with little-to-no wall space for radiators. Warmup underfloor heating systems, whether used as primary or secondary heat sources, offer you unrivalled comfort in a cost-effective manner. Kitchens are a perfect space to heat with underfloor heating solutions. We have a range of options for you to consider, suitable for different floor finishes and price points. The DCM-PRO System features a heating wire that is fixed onto a decoupling mat that can prevent damage to kitchen floors featuring larger stone tiles. 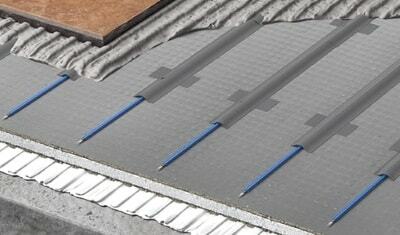 The StickyMat System uses heating wires ready-spaced onto an adhesive-backed mat that can be simply rolled out and adhered to the subfloor. The Loose Wire System is ideal for smaller kitchens or irregularly shaped kitchens. It provides a bespoke heating layout that can be winded around fixed objects. 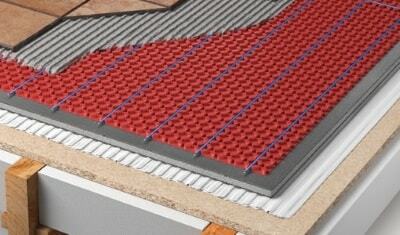 Underfloor heating can be installed with almost all flooring types. Certain floor finishes have top temperature restrictions which impact the heat output of the floor. Tiles or stones can be run at a higher temperature (e.g. 30°C), resulting in a higher heat output for a tiled floor. It is important to note that flooring that is too thick will hinder the efficient performance of the system leaving the floor temperature and maximum heat output too low to provide heat. 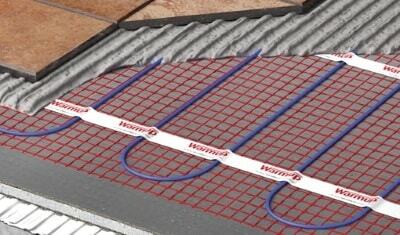 Warmup’s systems are competitively priced and due to the greater energy-efficiency of underfloor heating compared to typical central-heating systems; you can expect much lower running costs too. A rough estimate of a 4m2 Loose Wire system with insulation and a heating controller would be about £450 + VAT. Contact Warmup for a quote for your project. If you are renovating, electric underfloor heating is the ideal addition to your project as it will not increase the floor height and will give you a chance to enjoy warm kitchen floors for years to come. The system offers design freedom by freeing up more space as, depending on the heat loss, no bulky radiators are needed. Underfloor heating does not take up any wall space, allowing you to fully enjoy the kitchen of your dreams. In new homes, kitchens are often designed as part of a broader living space to better accommodate family and friends as an additional area for entertaining. Homeowners of older properties often alter and enlarge these spaces to match their modern lifestyles and add value for resale purposes. 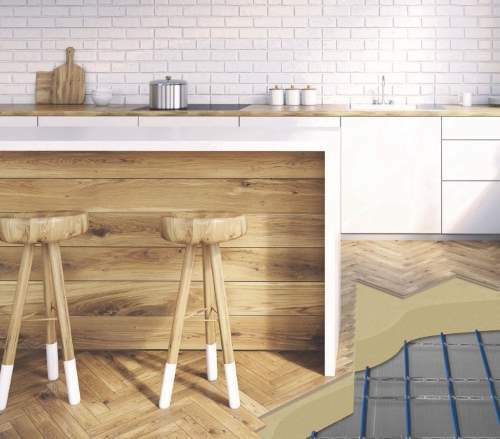 Underfloor heating is a popular choice amongst homeowners looking to increase their comfort and improve the energy-efficiency of their kitchens. Underfloor heating spreads warmth over the entire floor area, utilising radiant heat to gently heat the room to the desired comfort temperature.